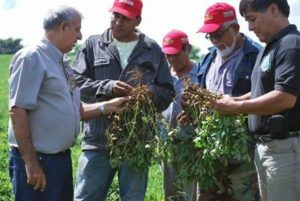 A very strict national quality control programme for peanuts has made Nicaragua an important peanut exporter. COPROEXNIC is a strong Nicaraguan cooperative serving 2000 farmers in 12 different communities with technical assistance and marketing, aiming to improve their livelihoods. The farmers cultivate the runner type Gorge 06G. Quality and food safety are controlled from farm to ship, in an integrated supply chain with full traceability. COPROEXNIC has a good track record of exporting to North-America, and is now expanding into Europe as well. European sales are supported by Mercadero. COPROEXNIC provides technical assistance to its farmers and focuses on crop collection, processing, marketing and exporting organic farm products like organic peanuts. The peanuts are processed in the factory of Cukra Industrial in León, which holds HACCP and BRC certification, as well as organic certification. COPROEXNIC cultivates close relationships of trust with clients. The peanuts are certified organic by Biolatina and Mayacert, to EU and NOP Standards.